Injured in a car crash? Call Dr. George Rubin today for an appointment or consultation. Hartford Physical Medicine in Hartford, CT provides quality care to patients through the expertise of Dr. George Rubin and Dr. Matthew Chere. Hartford Physical Medicine is the premier facility for the treatment of orthopedic injuries. We specialize in treating injuries caused by automobile accidents, slip and fall accidents, sports injuries, and workplace injuries. We can also help reverse the effects of injuries caused by repetitive motion, poor posture, and poor lifting habits. At Hartford Physical Medicine, we believe in promoting wellness through injury prevention and health maintenance. Our multi-specialty approach offering Physical Medicine and Chiropractic treatment combined with traditional medical services provides the most comprehensive and logical approach to injury treatment and rehabilitation. Radiology and Advanced Neuro-diagnostic testing performed on site. 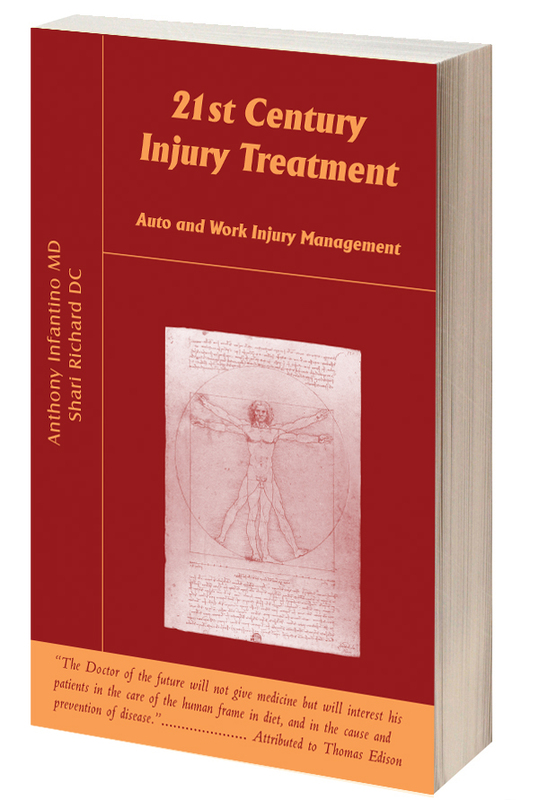 This book serves as a blueprint helping patients and other professionals navigate their way through the healthcare system with respect to musculoskeletal injuries. We are happy to present this text outlining specific definitions of injuries as well as diagnosis and treatment options available in the current healthcare climate. This book is unique in that it provides a synopsis of probable diagnoses, each phase of treatment and care as well as suggestions for aftercare once discharged from direct treatment by a physician. Authored by Matthew Chere, D.C.
Our multi-disciplinary approach provides an effective treatment method for pain and injury due to accident or injury. The multi-disciplinary approach of Physical Medicine and Chiropractic restores the health and mobility of the spine to improve accident recovery. The Multi-disciplinay approach brings together both Physical Medicine and Chiropractic to bring and advanced approach to your work injury.